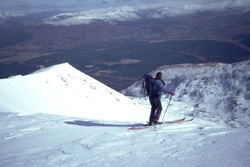 Scotland’s longest established ski area is just down the road at Glencoe Mountain Resort, and on a good day still provides skiing of a quality unrivalled across the rest of the Scottish ski resorts. Meanwhile, Scotland’s newest ski area, Nevis Range, is about 40 minutes in the opposite direction. Dropping in ‘over the back’ will satisfy many experienced skiers and boarders, while the more gentle lower slopes provide an excellent area for beginners when snow conditions permit. Both resorts open throughout the year, allowing for chairlift/gondola rides, mountain walks and other activities. We wish we had a pound for each time we were asked that one! And the answer…, well, its not that straight forward. Conditions vary enormously and the best advice is always to try and use the available resources to check a few days ahead if you can. Snow can fall on our mountains from late summer through until spring, but generally, accumulations won’t really build up until at least mid/late December. With freeze/thaw cycles and strong winds as well, winter in the mountains can be unpredictable. That said, catch it on a good day and it can be absolutely fantastic. Late season (March/April) can often be excellent with good accumulations, long daylight hours and less cold temperatures. The resorts themselves (links as above). Usually up to date in the season. Your local accommodation – Most businesses in the Glencoe area will receive details of conditions at both ski areas each morning during the season. Specifically tailored to the mountains, giving details of freezing levels and weather at the higher levels. 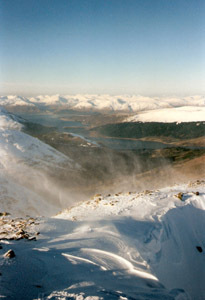 SportScotland Avalanche Information Service. Forecasters trek into the hills every day during the winter and make an avalanche forecast based on current and predicted snow conditions. Invaluable! Also check out the SAIS blogs for Glencoe and for Lochaber. Will we be able to get there? Again, a very popular question. Contrary to popular belief, the Highlands isn’t a barren Arctic wilderness in winter and, at sea level at least, is usually relatively mild. Chances are that when it snows you’ll have more problems in your local area than you will here. The road over the Rannoch Moor rises to over 1000ft above sea level and can get a bit wild. However, closures are rare and often short lived – and there’s always the coast road via Connel Bridge in extreme cases, an addition of about 40mins to your journey. Traffic Scotland carries up to date information on road conditions, including road works, accidents etc.